To wrap up 2010, I’ve made some new improvements to NovelRank, so I thought I should give the community an update. I hope you are having a wonderful holiday break and that your sales, especially for e-books, have been huge after Christmas Day! The initial round of ‘sales estimate’ updates were skewed very high. The formula has been fixed and reapplied. Did a bit more tweaking based on feedback, trying to never overestimate. Done for real this time! This entry was posted in News and tagged Amazon.de, Germany, inactive, user pages on December 30, 2010 by Mario Lurig. 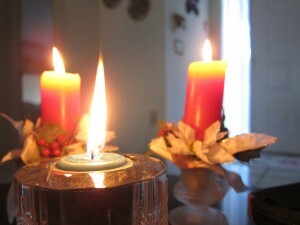 FYI: The picture used was taken by me this Christmas, when visiting family. It will be on Flickr for download (under Creative Commons: Attribution) later today tagged with the word ‘candles’ ‘Christmas’ and ‘flame’.